Champagne breakfast, champagne lunch, champagne dinner, champagne and snacks…., most chefs think that champagne is the most versatile wine with which to match most dishes. Champagne loves salt, cuts across light fats and oils, potentiates umami, and loves to dress up natural or smoky flavours. Champagne is the easiest wine to match with all courses of a meal. Additionally, there’s a broad spectrum of light to robust champagne, ranging, for example, from Billecart/ Delamotte/ Laurent–Perrier/ Taittinger through to Krug/ Bollinger/ Charles Heidsieck/ Drappier/ Gosset/ Veuve Clicquot. The sheer number of grower champagnes offers many further options. So what harmonises with what? Young NVs match the Champenois cheeses perfectly — Langres, Maroilles, Chaource — as well as complementing others such as Comté and Parmigiano Reggiano. The lighter champagne styles make great apertifis – with gougères with a pinch of cayenne and parmesan, puff pastry straws with an anchovy filling, lightly spicy pakhoras, plain old potato crisps or salty buttery popcorn. Fish. Olive bread. Olives (but not in vinegar, please). Salted nuts. The more full–bodied champagnes love to cut across any type of creamy sauce, as well as harmonising with mushrooms, charcuterie, pork, chicken, veal, or small game birds. Try caviar with blinis and sour cream, eggs many ways — omelettes with fillings of crab or mushroom, or eggs benedict, or truffled or parsleyed creamy scrambled eggs, stuffed hard–boiled eggs topped with anchovy. Crisply battered fish and chips (French fries) also respond well, as do spring rolls and many other Chinese yum cha dishes, salty ham, creamy pasta and risotto, Swiss potato cakes (Röesti) with smoked salmon; gravlax, fondue, crisp planks of pancetta, pissaladière with onion and anchovy, duck or pork rillettes – the list goes on. Carol Duval–Leroy suggests fruitier champagnes be served with Beaufort, Gruyère, or Emmental cheeses. Their web site suggests saddles of young rabbit, veal chops, Brie, Camembert and Comté. Taittinger suggests lamb with chanterelles, crayfish, mushroom quiche. Arnaud Lallement (three starred Michelin restaurant L’Assiette Champenois) serves grilled turbot, mushrooms, vin jaune and light and smooth potato gnocchi with Krug MV. While you’re there, try the shaved foie gras – also with Krug MV. Extra time on the yeast lees adds a layer of complexity. Accordingly, the food matches can be more complex — richer sauces, heavier meats, tempura vegetables and truffles. Mushrooms from the forest. Salted or smoked pork. Duck. Game. Oily fish. Creamy sauces. Aged NV champagnes can match tasty cheddars, and can cope with herbs and spices. Think cumin-spiced kofte with a minty yoghurt sauce, Cajun spiced rare lamb chops. Suggestions: Carol Duval–Leroy suggests Lancashire cheese. Their web site recommends white meats in cream sauce, and fresh salmon, lightly cured ceviche style with lime. Gosset suggests almond meringues with walnuts and raisins with their Grand Millesimé. Not too much sugar in the meringue, please. Moët advises king prawns with citrus, smoked haddock with aniseed butter and puréed fennel. Taittinger suggests white tuna carpaccio with truffles, while I suggest Les Berceaux’s bresaola with white truffle and lemon infused olive oil. It works superbly. And please don’t wince if I suggest the salade de gésiers (gizzards) available in so many French bistros and brasseries. They are delicious, and so is the accompanying champagne. Oysters, shellfish (shrimp, prawns, lobster), white fish, caviar, smoked salmon, taramasalata on potato biscuits, lightly steamed vegetables, ceviche, sashimi. Milk–fed veal. Chinese chicken broth with ginger. Goat’s cheese. Feta. Artichoke heart quiche. Light creamy seafood sauce. Creamy and aromatic dishes, sweetbreads. Smoked oysters. Scallops. Believe it or not, a blanc de blancs weighty with age can manage rare roast beef. Light meats, including lamb. Mushrooms. Game birds. Pork. Older blanc de noirs can take on game and offal, as well as rich goose. And desserts such as baked fruits with almond tuiles and toasted nuts. Shellfish, smoked fish. Ham. Dessert only if the wine has a sweeter, fruity profile, and the dessert is not too sweet. My favourite match for a savoury rosé is smoked duck breast. Delicious with duck, pot au feu, casseroles, rich and savoury dishes to match, spices and stronger fresh herbs. Moët recommends scallops with grilled red peppers and chopped almonds. Stunning with foie gras, or pâté at ambient temperature or slightly warmer, and, of course, many desserts such as summer pudding and other fruit based desserts. But also try sweet roasted root vegetables like carrots, parsnips and sweet potatoes. Not too spicy hot Indian food. Carol Duval-Leroy suggests Thai food. The Duval-Leroy website proposes almond galette, bread and butter pudding, jam pancakes, and apple and quince tart. Match food as you would with any still white or red wine, not forgetting the French specialties like steak frites, pâté en croute and terrines. Many champagne websites contain wonderful suggestions for matching champagne with food. Here are just a few – to view them please click on the name. Fortunately, there are now books available, at least in France, giving much good advice and supplied with inspiring pictures. Look for Jean-Marie Curien’s or Franck Wolfert’s books, or the Hachette’s mini-guide. Even if you can’t read French, a picture tells a thousand words. For all champagne, avoid acids, vinegars (no pickles, sorry), chili (which kills most wine). Opening champagne well in advance, but keeping it chilled retains the effervescence while allowing the wine to breathe. Chef Ann Oliver offers good advice on serving temperature. Always remember that champagne is, above all, wine. Mastering the art of matching food to champagne is not quite so much difficult as it is different. And it’s different only because it is less common. A great chef would be able to offer any number of food matches for Shiraz or Chardonnay, but champagne is a different thing. There is a famous quote attributed to British wine writer and wine expert Clive Coates, who, when asked how best to learn about wine, he offered the following advice. ‘If you want to learn about wine, buy a corkscrew!’ Well, of course times have changed, and one no longer needs a corkscrew to learn about wine, but the foundation of his advice remains the same…possibly forever! 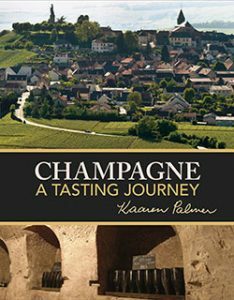 If you want to learn about champagne, the advice is precisely the same, you have to drink it! Where you start with learning about matching champagne to food, is, of course, up to you, but starting without food has its advantages for the following reasons. Champagne is by nature a chameleon so that when first opened, she can be an exotic Eastern dancer, dancing to her own tune and taking off layer after layer to show more body, more personality, until the final layer which often eventually reveals her true naked beauty. This occurs rarely in the first moments of opening the bottle or tasting the champagne, but is the result of the wine’s exposure to air over time. Temperature and taste with champagne can be wicked and ugly sisters, difficult to gauge and critical to the match when it comes to serving with food. This is another reason why tasting a bottle at leisure, with enough time to ascertain the changes, is so important. Getting the perfect match might be as simple as removing a bottle from the fridge 30 minutes before you will serve the food, or even pouring the wine 10 minutes before the dish is served. The latter detail can indeed be problematic, because diners eager to taste the wine may drink it before the food is served…this eventuality of course requires explanation! Lastly, the nuances need to be properly evaluated. It is foolish to think that all rosés are destined for the dessert end of a champagne dinner. It is, of course, nonsense, because so many champagnes have a distinctively savoury profile. It is equally daft relegating other styles to the savoury side of the meal. No better example could be found than, say, a bottle of Launois Le Mesnil – Quartz (NV) Grand Cru Blanc de Blancs – three different lovers in a single glass that, to start with, are tight and shy, only to finish with luscious and sensually ripe organic apple, of the old variety type, and English toffee caramel. Or try the perfect match – Michel Guerard’s million layer apple cake, made with nothing more than good apples and caramel, but a match that only exposed itself after the bottle had been open 30 minutes and somewhat warmed to the room. Yes, it takes time and patience and flexibility to get the right match (especially in the instances of rare champagne, where chefs invariably work from tasting notes). Sadly, all too few chefs get the opportunity to experience the wines in this circumstance before they design their menu.